Cardinal Raymond L. Burke ordained Canons Peter Heidenreich, Benjamin Norman, Matthew Weaver and Luke Zignego to the priesthood for the Institute of Christ the King Sovereign Priest Aug. 2 at the Oratory of Saint Francis de Sales. The men lay prostrate on the floor during the Litany of Saints. Joe Slama is a reporting intern for the St. Louis Review in summer 2018. Among ordinations for the Institute of Christ the King Sovereign Priest Aug. 2 at St. Francis de Sales Oratory in south St. Louis, one may strike many Catholics as out of the ordinary. Abbé Alex Barga was ordained a subdeacon by Cardinal Raymond Burke, who also ordained four men to the priesthood. Subdeacon is a liturgical role in the Extraordinary Form of the Mass, or Tridentine Latin Mass, the form of the Mass as it was celebrated before the Second Vatican Council. A subdeacon is responsible for preparing the bread, wine and vessels for the Eucharist as well as reading the epistles. As the name implies, subdeacons assist deacons. They also promise celibacy and recite the same hours of the Divine Office as priests. 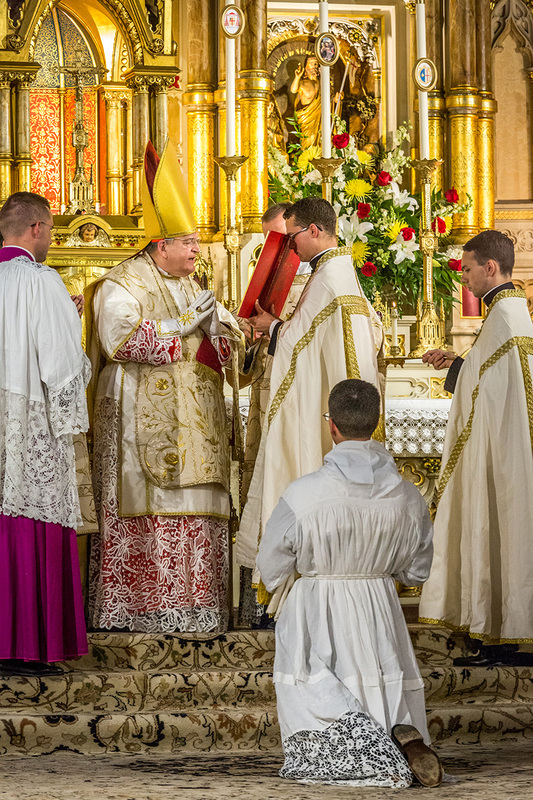 Abbé Alex Barga knelt before his Cardinal Raymond L. Burke as he was ordained to the subdiaconate for the Institute of Christ the King Sovereign Priest at the Oratory of St. Francis de Sales. A subdeacon is a liturgical role in the Extraordinary Form of the Mass, who assists the deacon, prepares the vessels and reads the epistle. Originally from Ohio, Abbé Barga was considering becoming a brother in a religious order in his 20s when he learned about the institute. He has been an oblate at the oratory since 2008, assigned to St. Louis shortly after joining the institute in Wisconsin. An oblate is a member of a religious community who hasn’t made a profession. Members of the institute are known as “abbé,” a French title for clergy. At the Rite of Ordination, Abbé Barga lay prostrate on the sanctuary floor along with the priestly candidates as the congregation and choir sang the Litany of Saints. Ordained first, Abbé Barga chanted the epistle, from the second letter of St. Paul to Timothy on high priesthood, before the ordination of the four priests. The other four newly ordained are Canons Peter Heidenreich, Benjamin Norman, Matthew Weaver and Luke Zignego. “Being a subdeacon, that wasn’t my goal,” Abbé Barga said. 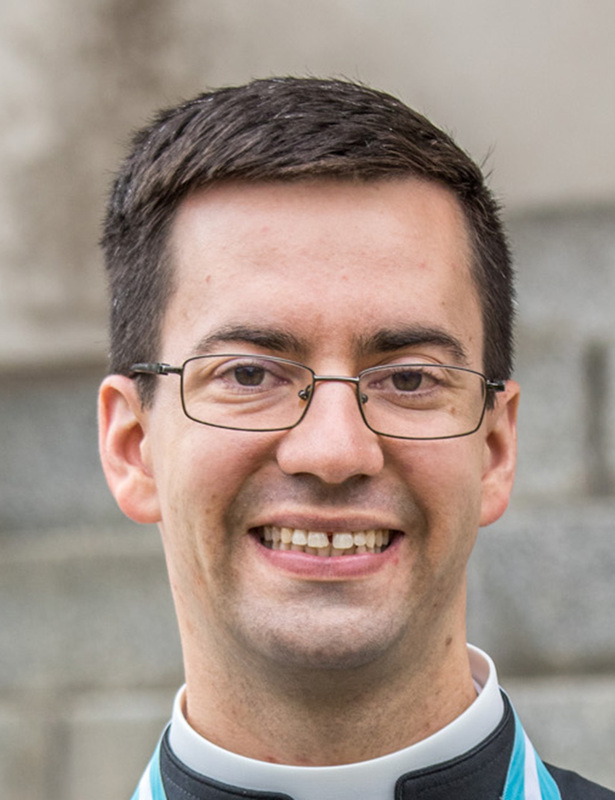 He originally intended to live with the institute as a brother; however, his discernment to this state in life led him through other liturgical roles to the final minor order of acolyte, and a year ago the institute’s U.S. provincial superior, Canon Matthew Talarico, asked him about becoming a subdeacon. Already an acolyte, his ordination didn’t require years more of formation as would be the case of a deacon or priest. Abbé Barga serves as sacristan for the community, and opens the oratory’s doors every day at 6:30 a.m. His days consist of the “work and prayer” that drew him to the institute; studies, largely of Latin, as well as prayer and the housework assigned to him form his day. This past year has been particularly busy as the community prepared for ordinations, celebrated in St. Louis rather than the institute’s seminary in Italy due to the unusually high number of Americans ordained this year, making travel easier for families. Now a subdeacon, Abbé Barga participates at a higher level in the liturgy that first attracted him to life as an abbé. Canons Peter Heidenreich, Benjamin Norman, Matthew Weaver and Luke Zignego were ordained to the priesthood for the Institute of Christ the King Sovereign Priest Aug. 2 at the Oratory of Saint Francis de Sales. In use in the Roman Church until after the Second Vatican Council, minor orders were once considered steps along the path to ordination. While many of the liturgical functions they performed are now assumed by lay ministers, the Institute of Christ the King Sovereign Priest has continued their use as part of its celebration of the Extraordinary Form of the Mass. Before becoming a subdeacon, deacon or priest for the institute, candidates must pass through the minor orders, so called because they come before the major or sacred orders of the clergy. There are four of these, all of which were in regular use in the Church prior to the Second Vatican Council. The first minor order, a porter, acts as doorkeeper for a church. The second, lector, proclaims Scripture at Mass. The third order of exorcist constitutes a ceremonial position, and is not synonymous with the exorcists instituted by bishops to drive out demons. The fourth order, acolyte, acts as an altar server. The major orders are subdeacon, deacon, priest and bishop, of which only the latter three are still in use in the wider Church today. The institute came to St. Louis in 2004 at the invitation of Cardinal Raymond L. Burke, then archbishop of St. Louis. At this time, St. Francis de Sales transitioned from being a territorial parish to an oratory, not assigned a specific territory. The institute is also present in Africa and throughout western Europe and the United States. The term “Extraordinary Form” signifies that the Mass according to the 1962 Missal is not the norm for the Church, coming from the Latin “extra” (“outside of”) and “ordinarius” (“norm”). The ordinary extraordinary forms of the Mass are not different rites, but different forms of the same Roman Rite.